It's called the Ouroboros. It is a mythological symbol of a snake eating it's own tail...a cyclical process of reflexivity and self-consumption...a continuum. It's been found in cultures thoughout the globe from the Aztec to the Ashanti, and yes it has even been used to represent the master of serpents himself, Dambala. Being a serpent God, Dambala has dominion over all things slithering and serpentine. Even Ogun, the Yoruba God of technology, lends his serpentine knowdedge to Dambala...often in the form of electronic communiques. It just so happens that Ogun, shared with Dambala, a reptilian conversation 'tween a techonology powerhouse and one of our own New Orleans serpents, Greg Meffert. The Atlanta based ISP, Earthlink, recently was awarded a city contract to install a public wi-fi system for the City of New Orleans. The contract was doled out by Greg Meffert, who was the city CIO at the time the contract was granted. techplayboy69: Hey man r u ther? dcoustElink: Hi Greg, how r u? techplayboy69: whoa man....hangin'. had a blowout on the boat last night. I'll send you pix...but don't open 'em at work...if you know what I mean (wink)...anyway, You guys ready to trick out my city? 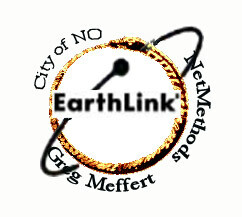 dcoustElink: Yeah....Earthlink is really excited about this whole project. We think it will really benefit the city to have a public wi-fi network. Aside from being a great business attractor, it could provide valuable communication needs during another hurricane. techplayboy69: Yeah Yeah...hurricane smurricane. We actually got a grant for 7 mill from the Dept. of Justice, or some Fed. org. back in 2003 to build a hurricane-proof communication system. dcoustElink: Right...I heard about that. A lot of competent national companies bid on that contract, but it kind of just disappeared...I can't imagine how many lives it would have saved if it would have been built....what happened. techplayboy69: Let's just say...we couldn't find a contractor who would play ball in our court. dcoustElink: What do you mean? techplayboy69: N.O. plays by a different set of rules, bro....if you're gonna do biz with us, you gotta use our playbook and our refs. dcoustElink: Not sure what that means...but along those lines, I have a question for you...why isn't the contract we're being awarded being put out for an RFP? Isn't that standard operating procedure for government contracts? techplayboy69: HAH!....you know what RFP stands for down here? techplayboy69: So listen here's the deal...you guys got the contract, don't worry about that...but I got this local company you need to bring on as a sub to do this whole thing...capiche? dcoustElink: Well...are they qualified to do the work? We'll need to assess what our needs are before we do the job or hire any contractors. dcoustElink: what do you mean by not optional? techplayboy69: figure it out...you're a smart guy...you work for a software company..
dcoustElink: Actually Earthlink isn't a software company, it's an ISP. techplayboy69: Yeah yeah....I had a software company too...whatever, it's all silicon stuff right? Just like my boat...Silicon Bayou. Sounds cool, eh? The chicks really dig it. dcoustElink: uh...yeah. Who is this company NetMethods? techplayboy69: It's this new comany out of N.O. They do exactly what you need. dcoustElink: How do you know what we need? techplayboy69: Because I will tell you what you need if you want this contract....you need this software company NetMethods. dcoustElink: We don't need software. techplayboy69: Yeah yeah...software, hardware...whatever. You need these guys. techplayboy69: It's owned by Mark St. Pierre. dcoustElink: Isn't that the guy you're currently sub-contracting for city IT services? techplayboy69: yeah...he's really good. He's starting this new company NetMethods....and guess who is gonna be the CEO of that company come Fall? techplayboy69: Yeah you right....me. Your's truly! Pretty cool, huh? dcoustElink: Actually no...it sounds illegal. techplayboy69: No way brah....my lawyer has it all under control...Hakuna Matata! No one will even question it. This city loves me...they think I'm a tech. God...all i gotta do is say "software" and all their eyes glaze over, it's great. My lawyer has it all worked out...don't fret. dcoustElink: This makes me really uncomfortable. techplayboy69: I told you don't worry. Listen we'll talk about it when you come down tomorrow. We're havin' a party in a suite at the IH...make sure you bring lots o' cash for the poker game. techplayboy69: HA! HA! You do now my friend....you do now. And again, why isn't Eddie Jordan and/or Charles Foti investing Greg Meffert?! This is enough to launch an indictment, don't you think?!?!?! Thank you for passing this along to us. I’ve put it in the hands of the chief executives involved. While obviously I can say little, I can say that our agreement is with the City, and is based on our having met the published wireless requirements documents. I’m afraid this may be, at least in our case, a case of unfortunate appearance rather than actual substance. The glass used in the making of the RT Ashley award is from a company called Uroboros.